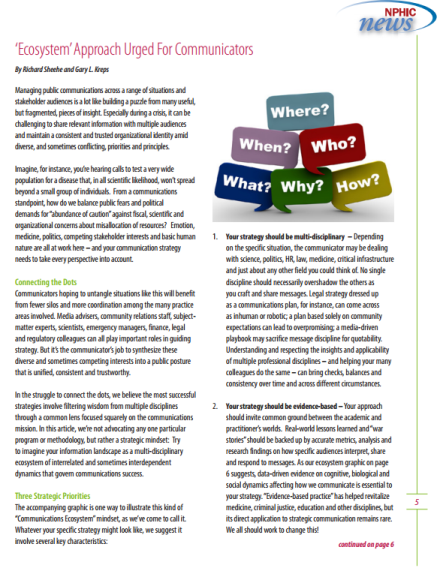 Thanks to the National Public Health Information Coalition this week for publishing an article I co-authored with my George Mason University colleague Dr. Gary Kreps on leveraging and “ecosystem” approach for strategic communication planning. Dr. Kreps directs George Mason University’s Center for Health and Risk Communication, where I serve as a senior research fellow. We also highlight the CDC’s Crisis and Emergency Risk Communication curriculum as a great example of putting these priorities to work. I hope you take a moment to read the article and see how your own communications strategy can benefit from an “ecosystem” mindset.